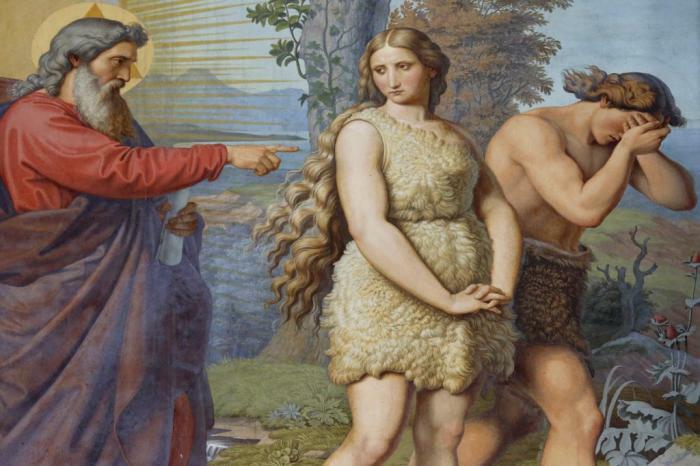 Who were Adam and Eve? The Book of Genesis tells the story of Adam and Eve, the first man and woman. After God created the heavens and the Earth, He created man to know Him, to love Him, to serve Him, and to live with Him forever in eternal life. The first man was named Adam. God created Adam from dust and breathed life into his nostrils. Adam, and subsequently all of us, are created in God's image. This does not mean we look like God in physical appearance. Instead, it means we are able to know and love God. We are created with great dignity, meaning we are worthy of respect, for we are created special by God. Adam and Eve were perfect in equality, and equal in dignity, but different in special ways. Each one complimented the other. Together, in communion, they formed one flesh able to transmit life to their descendants. We are capable of knowing God. And while we may not understand God perfectly, we understand more of God than any of His earthly creations. We have free will, so unlike the animals we can make free choices. We can choose to love or not, to serve or not, to follow God, or not. We each have a soul. We are called by God to share in His grace, which is a share in God's life, and with grace, our souls will never die. When God created Adam, he created a living soul, from which all other men would follow. After creating Adam and setting him in the Garden of Eden to live in friendship, Adam noticed all of the animals had companions, but he had none. God in His wisdom decided to create Eve, the first woman. According to Genesis, God put Adam into a deep sleep. He removed one of his ribs, and from that single bone, God formed Eve. God gave to Adam and Eve the vocation of â€˝subduing the Earth," to be â€˝fruitful and multiply" and to be stewards of creation. As stewards, Adam and Eve, and all their descendants, which includes us, are to be caretakers of the planet. We are not to destroy it, but rather to take responsibility for it. Adam and Eve were created in Original Justice. They enjoyed grace, communion with God, eternal life, and they were friends with all the animals. They experienced neither heat, nor cold, nor pain and suffering. God issued one prohibition to Adam and Eve, that they must never eat the fruit of the tree of knowledge of good and evil, â€˝for in the day that you eat of it, you shall die." Yet the devil managed to tempt man, persuading man to prefer himself instead of God. Both Adam and Eve at of the fruit of the tree of knowledge so as to become like God in knowledge and glory. The moment they ate of the fruit of the tree of knowledge, Adam and Eve lost their grace and holiness. Their knowledge of God became distorted. Adam and Eve saw God not as a friend, but as one to be feared. They took shame in their nakedness and lost their harmony with one another. As a consequence of this Original Sin, a sin so great it has passed down to all of their descendants, Adam and Eve were cast out of the Garden of Eden by their own choice. They and their descendants were henceforth doomed to die. They experienced pain and every kind of suffering. Their children knew labor and strife. 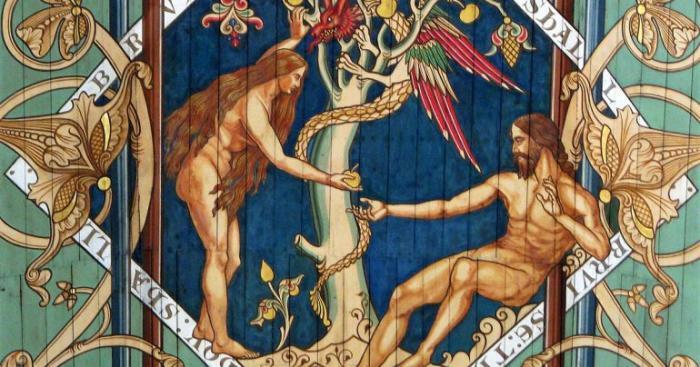 God issued one prohibition to Adam and Eve, that they must never eat the fruit of the tree of knowledge of good and evil, "for in the day that you eat of it, you shall die." God did not leave us doomed but promised at the moment of the Fall that He would send His Son to redeem us. We have inherited freedom and many other good gifts from God, such as our capacity for knowledge and love. But these are imperfect, since they are tainted by Original sin. Thankfully, God sent the Virgin Mary to be a new Eve for all mankind, and Christ to be a new Adam. Through Christ's sacrifice, our sins were atoned, and grace has been made attainable once again. Through the guidance of the Church we can achieve holiness and perfect our souls to fulfill God's plan for mankind.